Grant has been more than helpful - his communication is excellent. Booked a slot and was warmly greeted. I was able to ask a question about something that I needed clarification on and got great advice. Can't wait to get started on my project now! Will highly recommend to friends, family and anybody else looking for solar equipment. Sound company. Really like their web site very clear and informative, in stock item delivered promptly -wouldn't hesitate to buy from them again. The Sunny Island 6.0H is ideal for people who strive to be as independent as possible and want to be actively involved in shaping their own energy supply. This is true both for new plants and for plant operators who would like to retrofit their existing PV plants to emphasize self-consumption more. The battery inverter fits to all PV-plant sizes, PV- inverters and batterie typs. Depending on local conditions, it can also integrate other renewable energy generators into the storage system, such as small wind turbines, hydroelectric power facilities and CHP plants. 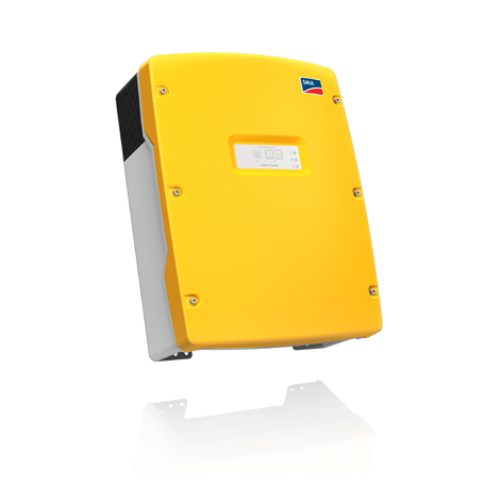 Developed from the successful SI-5048 these inverters are rated to give a power output of 6kW for 30 min. IP54 protection to allow outdoor installation if required and increased operating temperature range of -25 to +60 deg C.
Inverters can be combined together to assemble higher power systems and used with the Sunny Island Remote Control which gives a single point of operation. The powerful measurement solution for intelligent energy management within the SMA Smart Home: The SMA Energy Meter takes phase-exact and balanced electrical measured values as a grid feed-in and purchased electricity meter and communicates these values via Speedwire. Thanks to its ability to quickly acquire measured values, the SMA Energy Meter is the ideal supplier of data for intelligent energy management within the SMA Smart Home. All PV generation data, purchased electricity and grid feed-in can be transmitted via standard Ethernet cable to the Sunny Home Manager, for example, or to the Sunny Boy Smart Energy. This, in turn, facilitates optimal energy monitoring, effective load and battery management and reliable active power limitation at the grid feed-in point while taking self-consumption into account. Simple to install and commission, the Sunny Home Manager is the ideal solution for simple solar PV array monitoring and intelligent energy management. The unit provides an overview of all the energy flows taking place in the house, displays recommended actions and is able to control loads via SMA radio-controlled sockets automatically. The device learns the typical consumption pattern of the household and combines this information with a forecast of the plant-specific PV generation. If you need a longer cable please let us know. Made up to size for you for connecting your batteries together.